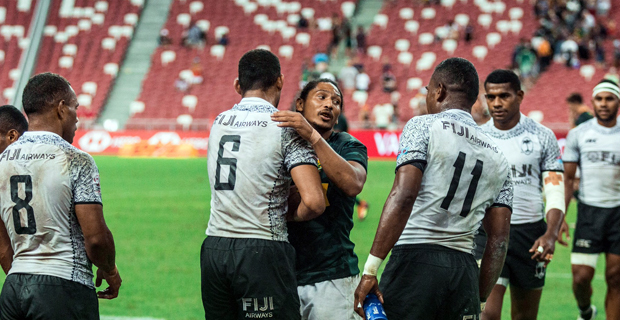 The Fiji Airways Men’s National 7s Team will now take on South Africa in the final of the Singapore 7s at 11.00pm tonight. Your #Singapore7s cup finalists are @Blitzboks and @fijirugby. Fiji defeated England 26‑12 in a thrilling Cup semifinal. Josua Vakurinabili scored Fiji’s first try and they were solid in their defense despite the strong attacking skills from England. Fiji continued to pressure England throughout the match and a strong run from Vakurinabili who kept his balance made a cross for Fiji’s second try in the 4th minute of the first half. Fiji led 12-0 at halftime. England had a man‑advantage for two minutes after Paula Dranisinukula was yellow carded for tackling in the air. The English side put one on the board, then Dan Norton delivers a massive try‑saving tackle before Aminiasi Tuimaba was yellow carded for a deliberate knock‑on. England crossed the try line for their second and final try in the match. Fiji scored two more tries through Sevuloni Mocenacagi and Meli Derenalagi within the last minute to seal the win for Fiji. Fiji 7s coach Gareth Baber says the players have worked hard and stepped up their preparations after losing key player Jerry Tuwai. Meanwhile, USA was denied a place in the final as they lost to South Africa 24‑12 in the first semifinal.